Scientific Name(s): Arctostaphylos canescens Eastw. The photograph for today’s entry is courtesy of manzanitas and conifer enthusiast, Michael Kauffmann. Michael is the person behind Backcountry Press, an “independent publisher of web and print media whose themes explore natural history, ecology, and the western [North American] landscape”. Complementing previous excellent works on the conifers of western North America, Michael and co-authors are soon to release a new book, Field Guide to Manzanitas: California, North America, and Mexico. I pre-ordered a copy for the Garden today, and am very much looking forward to it. Manzanitas are the “rock stars” of woody shrub diversity in California, reaching this status by way of amazing adaptability to the varied environments within the California Floristic Province. Most manzanita species depend upon fire for their regeneration and, while found on a wide variety of substrates, preferred soils are typically shallow, rocky, and/or nutrient poor. Like many other California evergreens (including my beloved conifers!) the hardy manzanitas have benefited from environments wherein competition from many plants is reduced and their own adaptability to poorer growing sites allows them to thrive. This, somewhat ironically, has made the unassuming “little apple” the most species-rich shrub genus in the California Floristic Province. Arctostaphylos canescens, or the hoary manzanita, ranges from southwest Oregon south to California’s San Luis Obispo County. There are historic records from San Diego County, but I would guess the species has been extirpated there since the last record was from 1903. This erect shrub ranges in size from 0.3 to 3m. The epithet canescens is in reference to having the property of being canescent (a good way to extend a Scrabble word), which is defined as “growing white, whitish, or hoary”, or in particular, “having a fine grayish-white pubescence”. These small hairs cover much of the plant: the leaves, the inflorescences (including inside the flowers, apparently — I will have to look for this), and the fruit (many more photos available from CalPhotos: Arctostaphylos canescens). Members of Arctostaphylos are often very photogenic, and have previously been featured on BPotD, including: Arctostaphylos pallida, Arctostaphylos nevadensis (with a great summary of the genus), and Arctostaphylos columbiana. Once again BPoD is part of my “learn something new every day” goal. 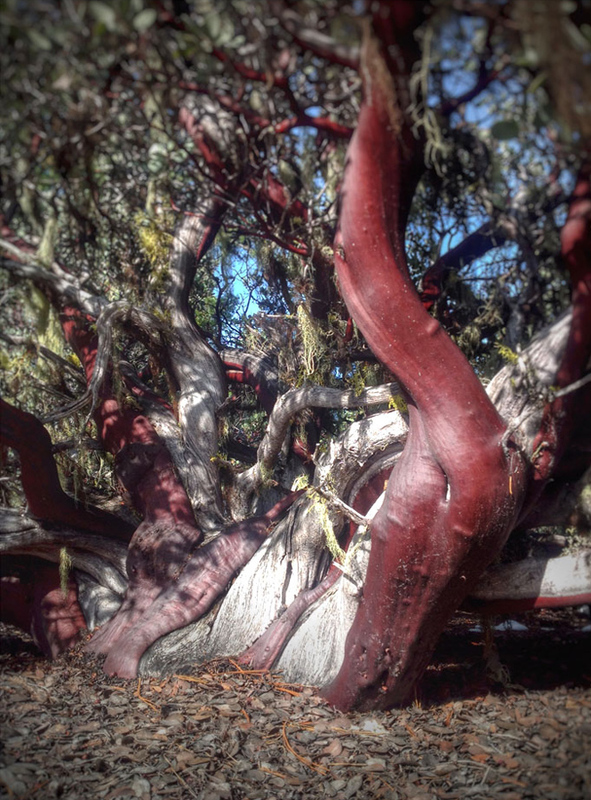 I had no idea the common kinnikinnick was related to manzanita. Thanks! You’re certainly right about photogenic … it’s beautiful.